Owners of older diesel cars could be paid to scrap them under government plans to tackle pollution, according to newspaper reports. A diesel scrappage scheme would be part of a new strategy to improve air quality after Europe said UK proposals did not go far enough. The reports said ministers may opt for a scheme that pays drivers up to £2,000 towards a new, cleaner car. However, it is likely to be restricted to certain drivers to minimise costs. Options could include limiting payments to owners living in the areas suffering the worst pollution, or those on low incomes. The scheme is expected to be announced in the coming days. Diesel cars emit nitrogen oxides linked to lung conditions such as asthma, with older models said to be particularly polluting. The UK had almost 12,000 premature deaths linked to nitrogen dioxide in 2013, according to the European Environment Agency. That was the second-highest total in Europe after Italy. There are about 11.2 million diesel cars on UK roads, 17% of which are more than 12 years old. Neil Parish, chair of the Commons environment committee, supports the scrappage plan and will use a parliamentary debate on Wednesday to raise the proposal. He is expected to tell MPs that government funding of £500m would take nearly 10% of the five million dirtiest diesels off the road. This would target as many as half of the most polluting diesel vehicles in UK air quality hotspots, Mr Parish will say. Last year, the government was told to strengthen its plans to tackle pollution after a judicial review found its existing proposals to be "woefully inadequate". It is also said to be considering new taxes on dirty vehicles, although Theresa May has said she did not want punish drivers who have been encouraged to buy diesel cars by previous governments. Under the new scrappage plan, half of the payments could come from the government with the rest coming from car manufacturers. A previous scheme in 2009/10 offered drivers cash payments of £1,000 to trade in their aging cars. This was topped up by matching payments from the car industry and took almost 400,000 of the most polluting vehicles off UK roads. 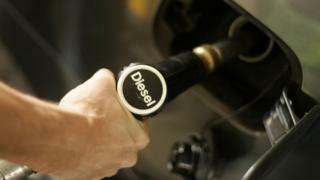 Video Has threat of increased costs put off diesel drivers?